While gambling is a national pastime, you don’t want to take too many gambles with your portfolio. 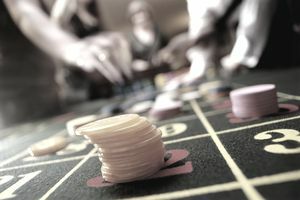 All investments have a risk, but if you hedge correctly and conduct thorough research, you can take some of the gambling out of investing, unless of course, you are targeting the gaming, leisure, gambling and entertainment industry. In that case, you may want to look to gaming and leisure ETFs. Like all exchange-traded funds, entertainment ETFs have some unique advantages over other investments, such as the way they are taxed and their convenience for industry exposure. Not that gaming ETFs don’t have risks as well, but they may be a good fit for your investing strategy if you are looking to target the gaming and entertainment sector. This gaming ETF tracks the Market Vectors Global Gaming Index (ticker = MVBJKTR), which according to Van Eck is a "rules based, modified capitalization weighted, float adjusted index intended to give investors exposure to the overall performance of the global gaming industry." The Fund has been trading on the NYSE Arca since 2008 and the majority of the holdings stem from two countries: the US and China. Some of the other countries represented are the United Kingdom, Australia, Malaysia, Japan, South Korea, Ireland, Greece, New Zealand, Italy, Gibraltar, South Africa, Sweden and some others. And speaking of the holdings, some of the company stocks within the fund and index are Las Vegas Sands Corporation, Sands China Ltd, Galaxy Entertainment Group, MGM Resorts International, Genting, Melco Crown Entertainment, Sega Sammy Holdings, and Wynn Macau. Consumer Discretionary is the top sector represented in the fund (over 95%), which makes sense, but there is a little bit of Information Technology and Financials in the mix as well as very small percentages of other factors. Of course, the holdings are always subject to change. PEJ is currently the only other gaming entertainment ETF on the market right now, and this fund correlates with the Dynamic Leisure & Entertainment Intellidex Index. And according to PowerShares, the Intellidex Index is designed to "provide capital appreciation by thoroughly evaluating companies based on a variety of investment merit criteria, including: price momentum, earnings momentum, quality, management action, and value. The Underlying Intellidex Index is comprised of common stocks of 30 US leisure and entertainment companies. These are companies that are principally engaged in the design, production or distribution of goods or services in the leisure and entertainment industries." Unlike BJK, all of the holdings in this ETF are from the consumer discretionary sector. And those holdings include stocks from companies such as Chipotle Mexican Grill, Starwood Hotel and Resorts Worldwide, Starbucks, Price Line, Time Warner, Liberty Media Corp, Scripps Networks Interactive, Discovery Communications, Buffalo Wild Wings, and Krispy Kreme Doughnuts. We talked about how any investment has risks, and these funds are no exception. So make sure to research each fund thoroughly. Look at its trading history, consult an advisor or broker, look at what’s in the ETF and see how it reacts to different market conditions. And when you have completed your due diligence, well, then, good luck!